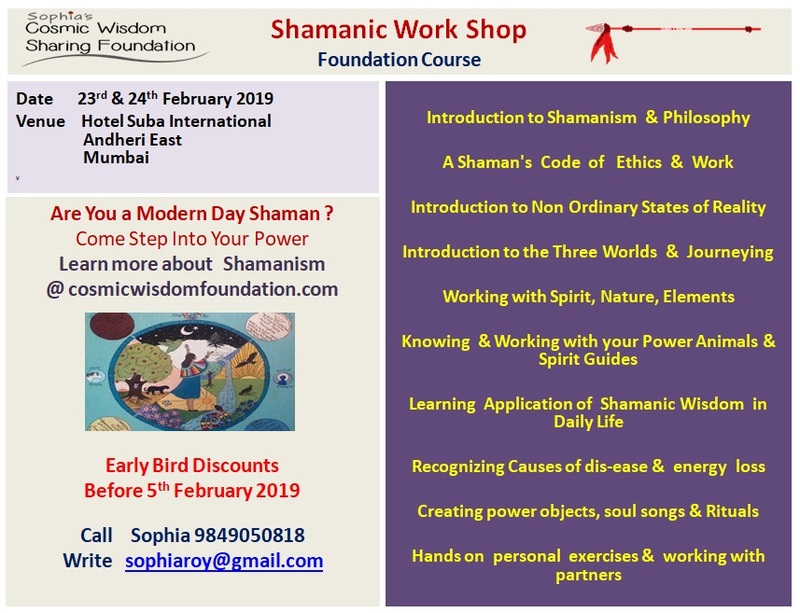 Sophia Roy Choudhury of Cosmic Wisdom Sharing Foundation brings to you an authentic & easy method of connecting to Shamanism. She has trained under many world renowned Shamanic Masters. She had been brought up by HimachaliShamans & initiated into Shamanism at a tender age of 6years. Shamanism is a way of life that is more than 20,000 years old. It is not a cult or religion. In today’s fast moving, commerce& technology dependent world, Shamanism offers ancient yet contemporary tools to live a healthy, intuitive& heart based life that is in Oneness with the entire creation. Using these tools you can identify & heal your inner blocks that prevent you from leading a fuller & meaningful life. As you progress on your path you not only create a wonderful life for yourself but know your greater purpose in life. You discover your role in shifting the world consciousness to greater beauty, happiness& tolerance. You learn how to become the Stewards and Care takers of Mother Earth & contribute to leaving a better world for future generations. During the Basic experiential workshop, participants are introduced to various aspects of Core Shamanism, the universal energy and common methods of the Shaman to enter non ordinary reality for problem solving and healing. Particular emphasis is on the classic shamanic journey, one of the most remarkable visionary methods used by humankind to explore the hidden universe, otherwise known mainly through myths and dreams. Participants are initiated into Shamanic Journeying, aided by drumming and other techniques for experiencing the Shamanic state of consciousness and for awakening dormant spiritual abilities. You will learn how to connect with Nature, Power animals and Spirit Guides. There are various levels of learning and nurturing one’s Shamanic practice. Once the Foundation Course has been completed, you will be eligible to take the other more advanced Courses. After course completion connect on an exclusive Face Book page for updates, meditations& Shamanic life tips. You will enter an exclusive world of Wisdom Keepers as you journey on your chosen path.